A total eclipse of the Sun has been witnessed in Canada, Russia and China, casting dramatic shadows and allowing a glimpse of the Sun's outer atmosphere. The Moon's shadow arced over the Earth as the lunar body passed directly between our planet and its star. 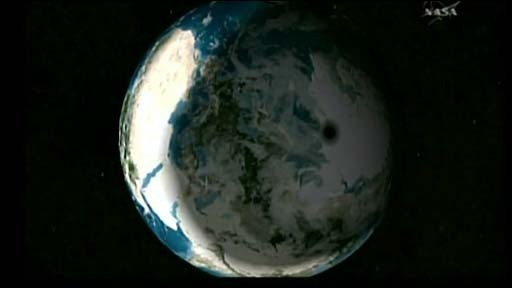 In all, the path of darkness covered about 10,200km (6,300 miles). 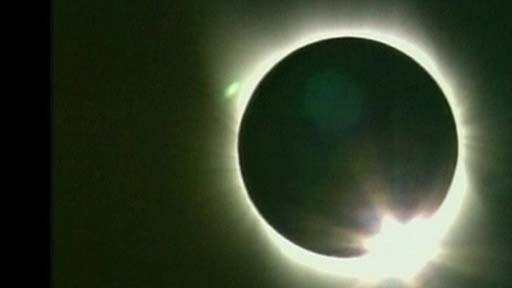 Russia saw the longest full eclipse, for two minutes, 27 seconds, at 1021 GMT - but the UK and most of Europe experienced just a partial eclipse. "Totality" began at sunrise at 0921 GMT in Queen Maud Gulf off Victoria Island in the territory of Nunavut, Canada. The instant of greatest eclipse occurred at 1021 GMT close to the Russian city of Nadym, before totality came to an end at 1121 GMT near the Chinese city of Xi'an, in Shaanxi province. Tourists and amateur and professional astronomers flocked to towns in the best viewing locations along the path of totality. In Novosibirsk, Siberia's cultural and scientific capital, more than 5,000 foreign tourists were expected to show up in the city. 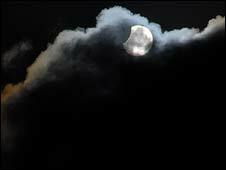 China experienced the eclipse just a week before the opening ceremony of Beijing's Olympic Games. Chinese TV was due to broadcast the eclipse live, with crowds of people gathered along the Silk Road, a fabled trading route through the country's western deserts. Eclipses were once viewed as unlucky events in China, but the country's media had rebranded the event as "the Olympic eclipse", reports said, hoping for good fortune ahead of the sporting jamboree. The eclipse allowed astronomers a glimpse of the Sun's corona - its outer atmosphere of super-heated gases. The area is usually impossible to see because of the bright light of the Sun, but is visible during a total eclipse as the Sun's light is obscured. Total solar eclipses usually take place about once every 18 months, and always at new Moon - when the lunar body sits directly between the Sun and the Earth. However, they do not happen every new Moon. The lunar orbit is slightly tilted to that of our planet and therefore the Moon's shadow often misses the Earth. The Moon's shadow has two parts: an umbra and a penumbra. The umbra is the "inner" part of the Moon's shadow, and people inside this zone will witness the full glory of the eclipse. The penumbra is the Moon's faint "outer" shadow. It will only give surface viewers a partial eclipse. In London, where the Moon's disc took its biggest bite out of the Sun at 1016 BST (0916 GMT), a maximum of 12% of the star was blotted out. Conditions were better further north. In Lerwick in the Shetland Isles, the Moon obscured as much as 36% of the Sun. Astronomical groups reminded the public that viewing the Sun without protective equipment - even in partial eclipse phases - could result in a retinal burn and permanent eye damage. Viewing the Sun's harsh light should only be done through proper solar telescopes or glasses, or through a pinhole projection system. Were you watching the eclipse?